Happy Saturday guys and dolls! I hope you are well rested and enjoying the awesomeness of the weekend. 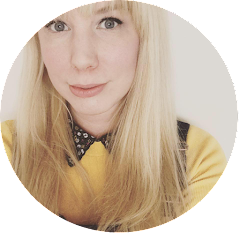 Today I want to talk about food, good food in fact great food! 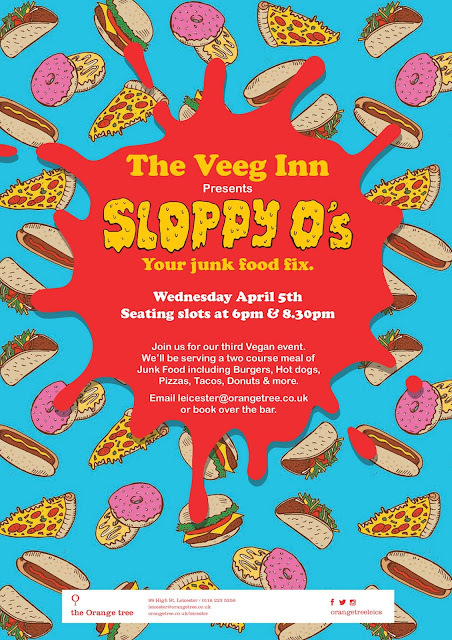 This month I was invited by the stupendous guys at The Orange Tree Leicester to come on down and partake in their third Vegan Event Sloppy O's. I attended their first Veeg Inn back in February and it was a night full of mind blowing vegan grub and cocktails. And with the Sloppy O's Event being a SELL OUT this was sure to be just as swell. Serving a two course meal of junk food including burgers, hot dogs, pizzas, tacos, donuts & more and all cooked fresh, by hand. I couldn't wait to get stuck in! The only problem was choosing what to order as I wanted to eat ALL the food! 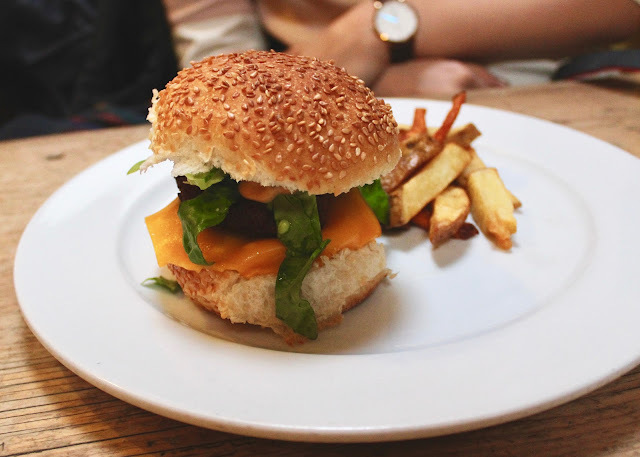 Beef flavoured soy patties with vegan cheese, house source, gherkins, sliced tomatoes & baby gem lettuce in a bun. 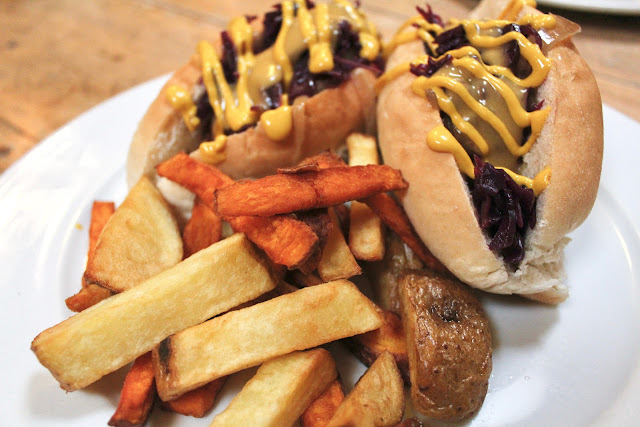 Vegan sausages in a hot dog roll, topped with sauerkraut, fried onions, cheese sauce & mustard. Stuffed cheese crust pizza topped with tomato sauce, chilli soy, green peppers, red onion & mozzarella style cheese. Corn taco shells filled with soy & black bean chilli, topped with guacamole, vegan sour cream & jalapeños. 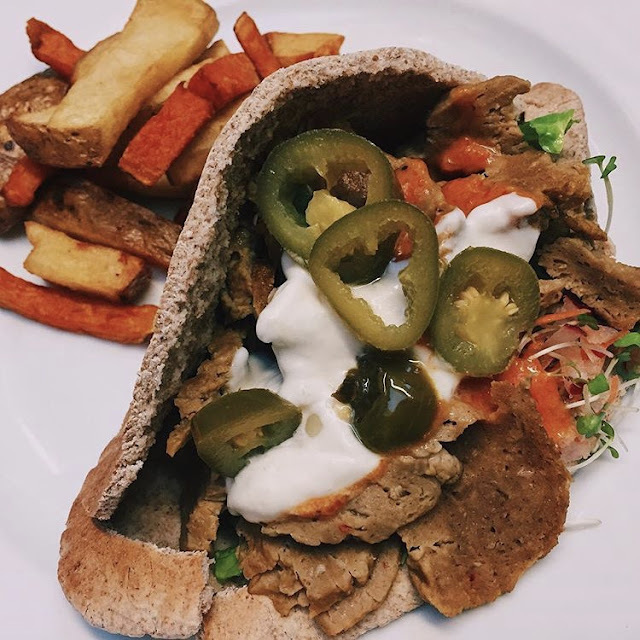 Chargrilled doner flavoured seitan served with chilli sauce, garlic mayo, salad & pickled jalapenos in pitta bread. Oreo & ice cream sundae. Filled donuts with dipping sauce. 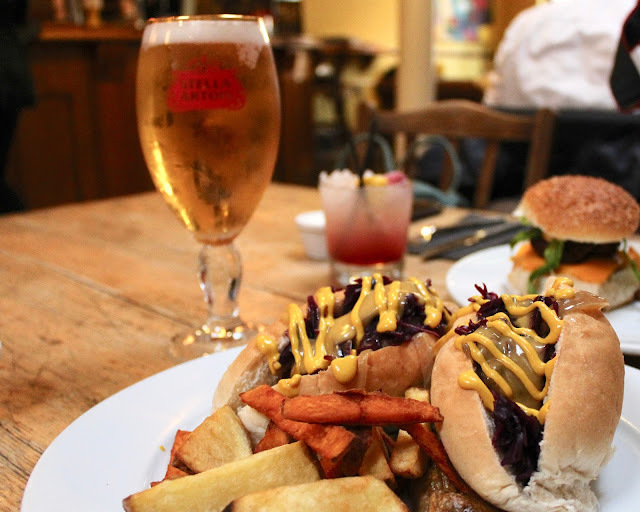 For my main deal (after a lot of deliberation) I went for *Hot O’s Dog vegan sausages in a hot dog roll, topped with sauerkraut, fried onions, cheese sauce & mustard with a pint of *Stella. All mains cost £9.95 and were served with a mix of sweet potato & regular fries (which meant I didn't have to choose between the fries YAS!). I totally completely and throughly enjoyed this. I mean I don't often get to sink my teeth into a load of vegan junk food and this vegan dish was the shizzle! 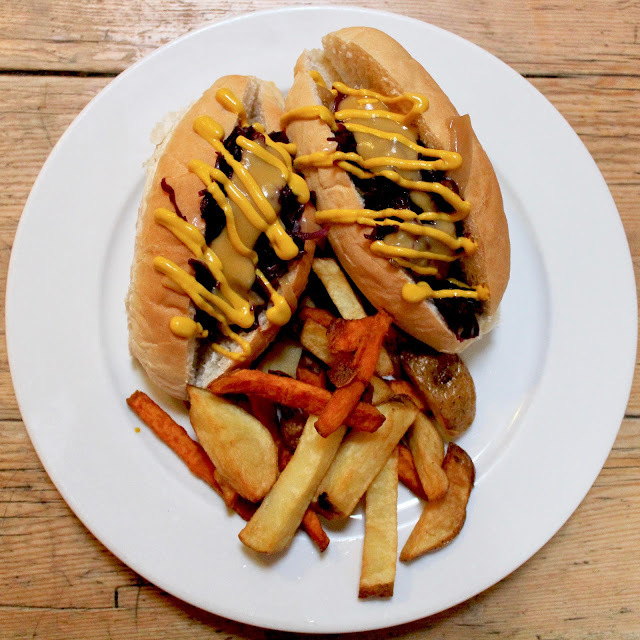 The sausages were tasty and full of flavour and the fries were scrumptious. I almost struggled to finish it all! My lovely friend Tiffany from Frost In Space came along with me for this vegan dining experience and she went for the Big O's Burger. Beef flavoured soy patties with vegan cheese, house source, gherkins, sliced tomatoes & baby gem lettuce in a bun. It looked da bomb! All deserts were a bargain at just £3! I don't have the biggest sweet tooth, I'm not really a fan of ice-cream and if I'm honest I don't like Oreos (I know.. but they just aren't my thing). However the Oreo ice-cream did look amazing and Tiffiny LOVED it as she devoured hers within minuets! I opted for *donuts served with a dipping sauce. And hell to the yeah what a good choice it was! 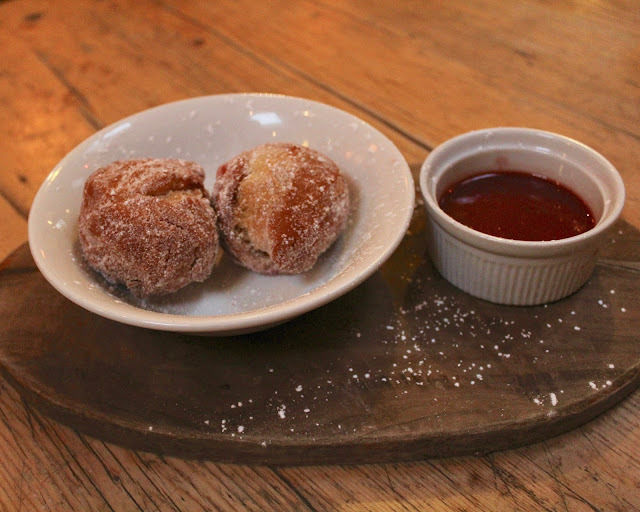 A delicious sugary fix with a tangy dipping sauce to compliment the donuts. Mmmmmmm! The atmosphere at The Veeg Inn was fantastic! I always adore visiting The Orange Tree I go often to work, have a meal and even the occasional tipple. The food is superb, the service is spectacular and the staff are friendly and welcoming. I'd highly recommend The Orange Tree Leicester for their vegan nights and even their everyday vegan menu. I can't wait for my next visit!